The council has announced the 2nd phase of the Carnegie Library redevelopment works: the fit-out of the gym and removal of the library space to one front room. The cost is approximately £1 million, additional to the £1.8 million spent so far on the basement excavation and additional buildings on the library garden. A `roof terrace' or `roof garden' has also been proposed by the CCT, but this would require planning permission and an additional £100,000 which is not included in the budget. The works are expected to be complete by December. The proposal also confirms that the current provision of 2 hours librarian staffing per day is only a temporary arrangement - funded by one-off Section 106 funds - and gives no assurance of any specific librarian staffing for the eventual re-opening of the library. The opposition Green councillors submitted a call-in of the proposal, on the grounds of the lack of details of the financing of the work. This call-in was rejected but Greens leader Scott Ainslie is appealing this rejection. The `community liaison' group meeting with the council over construction issues has been re-activated. Please contact the Friends if you would like to be added to this group. 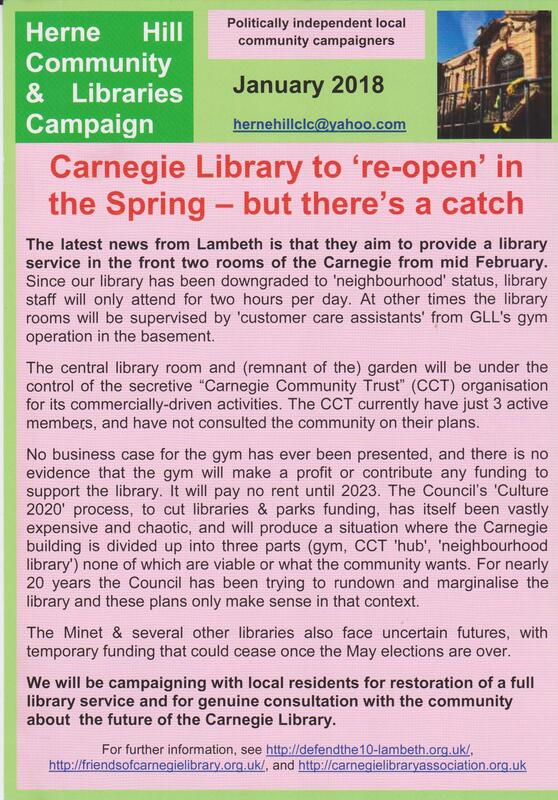 Ahead of Thursday's election, here are some facts about the situation for the Carnegie Library. Our latest bulletin Pages 4 and 1 and Pages 2 and 3. 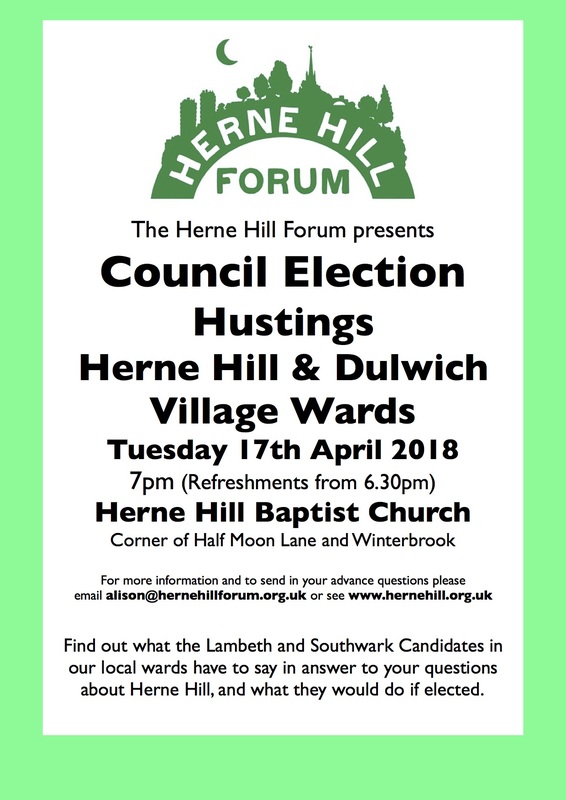 The Herne Hill Forum are hosting a hustings for Herne Hill (Lambeth) & Village (Southwark) wards, at 7pm on the 17th April, at Herne Hill Baptist Church (Winterbrook St). Library campaigners will be requesting that the Herne Hill candidates sign the Defend the 10 libraries pledge. So far the Green, Lib Dem and independent candidates have signed. 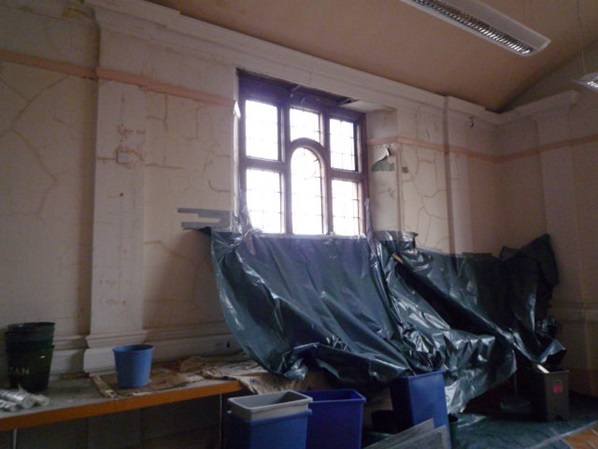 The Friends are working as community partner with Lambeth Archives on a project to restore the memorials formerly in Carnegie Library basement. Having discovered them there many years ago, we felt it was a shame to leave them on the floor gathering dust. Liaising with Herne Hill Society, we met with one of the Lambeth Archives managers in 2009 to list and photograph them, with the idea of cataloguing them and trying to learn their provenance. When the library was closed and preparations being made to excavate the basement and clear out the building, we expressed concern that the memorials needed to be carefully moved to a place of safety and their future ensured. They are in Brixton Library basement for now. The 24 memorials range from brass plaques to alabaster marble and other stone monuments; two came from schools, others are from the Boer War, WW1, WW2 and also to individual vicars or parishioners, etc. A book on St Saviour's Herne Hill (then in the local history section of the library) confirmed that the alabaster WW1 memorial in two sections had been in that church (including a middle section with St George, now missing), as was one to a woman parishioner, Harriot Nicholson who died in 1918. Preliminary sessions have taken place in St Saviour's School (built on the site of the church), including Year 6 learning about Harriot and her family. St Saviour’s Church was demolished in 1981, the same year the library and the parish hall were listed Grade 2. Its memorials were taken down and stored in the library undercroft alongside plaques from All Saints Church, South Lambeth and elsewhere. 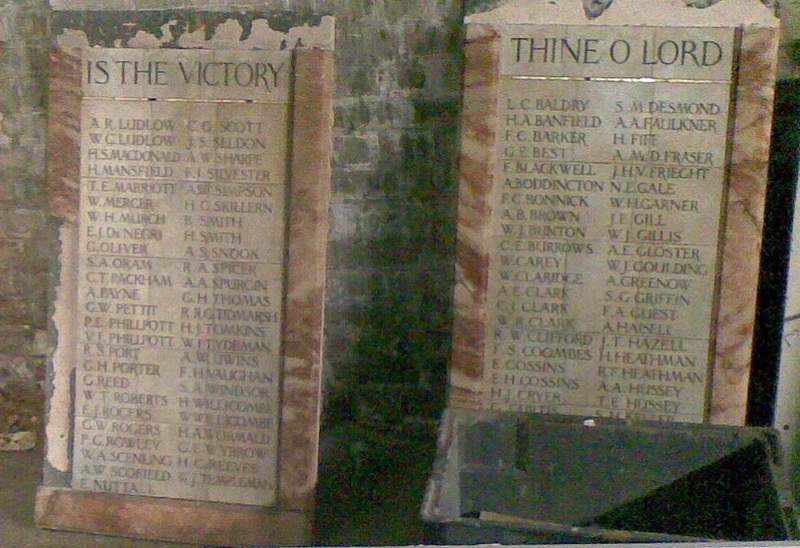 We are working with Lambeth Archives staff to secure funding to restore all the memorials. Conservation specialists Taylor Pearce have given advice and City & Guilds of London Art School are interested; the War Memorials Trust may be able to offer match funding. The restoration project includes workshops about conservation, research, and community memory. At the end of the project it is hoped that the fully-restored memorials will go on display. Can be expected to remain so for the next decade or two provided a proper programme of routine maintenance is carried out. Specifically, the architects and surveyors advised that the roof gutters must be cleared of leaves twice a year to prevent the gutters overflowing and discharging rainwater into the front rooms of the building. Clearing the gutters is a simple matter of accessing the roof from inside the building through a trap door and then walking along behind the parapet walls collecting the leaves. For years Lambeth's property management failed to clear the gutters until water came in and eventually spent a six figure sum on repairs to plaster mouldings damaged by the water. After the repairs Lambeth still omitted to clear the gutters. Shortly before the Council's cultural services were due to be inspected by the Audit Commission the Friends complained to the Commission about this and other matters. A one-year contract to clear the gutters quarterly was put in place before the Commission's inspection team arrived. At the end of the year it lapsed and water came in again. Lambeth insisted that the contract could not be renewed because "no paper trail" existed for setting it up in the first place. In response to further complaints Lambeth responded that library staff must wait for the gutters to overflow before the gutters could be cleared because Lambeth did not have a budget for "preventive maintenance" of library buildings but only a budget for "reactive maintenance." Eventually the library service gave up hope of getting any sense out of the property managers and themselves arranged for the gutters to be cleared twice a year. There was then no further ingress of water for a few years until Lambeth closed the Library in March 2016 and handed control of the building to its property managers. The gutters were due to be cleared the next month but this was not done and more water came in. The necessary routine clearing was still not arranged. The front rooms are currently too damp to occupy. The plaster work is in a disgusting state and will no doubt require more very expensive repairs. The following photograph was taken in April last year. The damage will no doubt be far worse by now. Lambeth have saved hundreds of pounds by omitting to clear the gutters and then spent tens of thousands of pounds repairing the damage which they knew would inevitably result. In due course they will no doubt argue that the building has to be sold because its maintenance costs are so high. To add to the cost Lambeth have had their contractors put up scaffolding twice for no reason, damage and then replace roof slates and done completely unnecessary work to the roof. Details are here. What they are doing to our library is not a money saving exercise. The planned gym will always need subsidising and it will never make a contribution to the cost of the library. Although the reduction in library opening hours would save about £125,000 a year in staff costs, Lambeth appear to be providing about the same amount to their Carnegie Community Trust to run the main room as a Church hall type of facility instead of the previous flexible use as a library and hall. So there would not be any saving overall. The disclosed estimates of the capital costs of the building works total £3 million. Final costs of Lambeth projects always seem to be a multiple of the original estimates. We should therefore expect the final cost of the works to be at least £5 million. Lambeth are currently borrowing at 4.7% per annum. Assuming a generous 20 years for repayment the financing costs come out at £400,000 a year. The basement is not deep enough for a gym and there are many cheaper gyms offering more facilities in locations more convenient for almost anyone who wants a gym. It would be hopelessly unrealistic to expect the gym to attract enough custom to cover its running costs, let alone generate an additional £400,000 a year to cover the financing costs. Spending about £100 million on "Your Nu Town Hall." Refusing to pay the water bill of £2,000 a year for the paddling pool in Ruskin Park. They say that the Friends of Ruskin Park, whose volunteers already manage and clean the pool, must pay this in future. However, there is a more sinister aspect to the current and proposed building work to the library in that all of it is more consistent with Lambeth's previously announced plan to sell the library for redevelopment than with providing a gym in the basement or restricting the use of the ground floor. The details are here. Lambeth's plans for our library are complicated and presented by them in ways which are confusing. The Friends have therefore tried in the following summary to describe all the key features as clearly as possible. For the sake of simplicity we have omitted the scandalous waste of money involved. Lambeth plan to open a library in the building in February, then open a gym confined to the basement in June and finally open the main room as a sort of church hall at an unknown future date. Neither the library nor the gym or the hall if it ever opened would be viable. The library would have barely enough books and these would be in a cramped space. There would not be a separate children's library, only a small area with furniture for children. There would not be room for a Teen Zone or space for socialising or group activities. The library would only be open for about two hours a day and it would be staffed by only one person, either a Library Assistant or a professional Librarian. In a matter of months Lambeth would no doubt announce that the library is not attracting enough visits or lending sufficient numbers of books to justify the space and quantity of books devoted to it. The gym would not have enough headroom for users to raise their hands above their heads or jump. This disadvantage combined with competition from cheaper gyms with more facilities in locations more convenient for most potential users strongly suggests that it would never break even financially. The hall after removing the bookcases and covering the glazed partitions would be an unattractive, echoey space with plain walls and the building would not have a kitchen. The existing kitchen and the small meeting room next to it are currently being converted to toilets for users of the hall. Even Lambeth's "community group" who would be expected to run the hall, Carnegie Community Trust, say that the plans are not feasible. They object that Lambeth could terminate their payments to the Trust in respect of the spaces occupied by the library and gym at any time, which would force the Trust into insolvency. Lambeth intend to open the library 11 weeks before the Council Elections after keeping the library closed for nearly two years. They plan to have the library open for 40 hours a week or more until a few weeks after the Elections instead of the usual two hours a day. It should be readily apparent that all this is blatant electioneering. The Friends will continue the campaign for restoration of the library comprising properly staffed suitable spaces for library use and activities compatible with a library.